.Like other Oklahoma towns, Oklahoma City began with the Land Run of 1889, which brought over 4000 settlers to the small village of Oklahoma Station, where a watering stop and post office had been built along the Southern Kansas Railroad tracks in 1887. By the time Oklahoma City was incorporated in 1890, 17 years before Oklahoma would be admitted as a state—and 21 before Oklahoma City became its capital—ten Jewish families had settled in the city and conducted Orthodox services. Despite this early activity, a formal Jewish organization wouldn’t be established in Oklahoma City for another 11 years. Still, the foundation was already laid for a community that lasts to this day. Soon after Jews arrived in Oklahoma City, they became actively involved in civic affairs. Since the city had no pre-existing social or economic elite, Jews were able to quickly move into positions of political prominence. In 1903, Seymour Heyman was one of three delegates who traveled to Washington, D.C. to lobby for the admission of the Oklahoma Territory—without Indian Territory—as a state. In 1904, only a year after he moved to Oklahoma City, Gustave Paul was named County Attorney. The following year, he became the City Attorney of Oklahoma City. Following the June 1910 vote to move the capital from Guthrie, Leo Meyer, Assistant Secretary of State, moved with his family to Oklahoma City. Meyer was one of the men sent to retrieve the state seal from Guthrie, and over the next few months helped move all the state’s official records to Oklahoma City. Shortly after, the Secretary of State, William Cross, was nominated to run for State Auditor, but his untimely death led the Democratic State Central Committee to select Meyer for the race. When Meyer won, he became the fourth-highest official in the state government. The legislature that assembled in 1913 was committed to “cleaning house” in state government and began to investigate nearly every state official, including Leo Meyer. The legislature accused Meyer of perjury and tried to impeach him along with the governor. Although a court found that there was no evidence of Meyer’s perjury, Meyer resigned from public office out of frustration. Meyer went on to have a successful career in banking and the oil business. More than politics, business ventures shaped the life of early Jewish settlers in Oklahoma City. Isaac Lowenstein arrived in 1889 with the opening of the territory to settlement. Lowenstein quickly bought a plot of land, which became home to the meat market he ran until 1907. By 1909 he had opened Oklahoma City’s first vaudeville theater. In 1914, the Lowenstein family took over another vaudeville house, and Isaac’s son Morris, who became known as “Mr. Show Business,” would continue to run the Majestic movie theater for 40 years. Brothers Harry and James Gerson also came to Oklahoma City with the opening in 1889, and by the next year established the Gerson Brothers clothing store. Their brother George Gerson, became the first druggist in town. B&M, Oklahoma City’s first “one-price store,” was opened by Joseph Myer and Sol Barth in 1898; after the partners sold it in 1927, the store became Rothschild’s B&M. Seymour Heyman arrived around 1897 and opened The Hub clothing store. Though he only lived in Oklahoma City for 15 years before his death, in that time Heyman became the first president of the local Chamber of Commerce, president of the city’s Board of Education, and founded the Oklahoma City Retailers’ Association. He also raised the funds that brought two meatpacking plants into Oklahoma City, turning the city into the state’s packing center. Heyman was also the owner of the Oklahoma City Mets baseball team. Later, Heyman Street was named in his honor. By the early 20th century, the Oklahoma City Jewish community had begun to organize. The Hebrew Cemetery Association of Oklahoma City was incorporated in July 1901, with David Wolff as its president. The next year, four men, including Isaac Lowenstein, purchased land in Fairlawn Cemetery for a Jewish burial ground. It was Rabbi William Greenberg of Dallas, who had come to town to give a lecture, who convinced Oklahoma Jews to establish a Reform congregation. When they formed Temple B’nai Israel in 1903, Rabbi Greenberg’s $25 contribution was the first donation for a permanent home for the congregation. An article published in the Oklahoman newspaper notes that both Jews and Christians were present at the meeting that established B’nai Israel. Of the 21 founders, 15 owned or worked in stores, while at least 11 were German or Austrian born. A majority had been in Oklahoma City for less than two years. Seymour Heyman was the first president of the congregation. B’nai Israel relied on a student rabbi from Hebrew Union College, Harry Friedman, to lead services for the High Holidays in 1903. The following year, they hired Arthur Lewisohn, then a student at HUC, to be their first full-time rabbi. Rabbi Lewisohn’s tenure was cut short when he died in 1905. B’nai Israel was able to bring down Rabbi Alfred Godshaw, a faculty member at HUC, to lead their first confirmation service. The six students, five of them girls, were taught by Sarah Herskowitz. While the congregation did not have a rabbi, B’nai Israel held weekly Friday night services in a church building. The services were led by Adolph Engelsman, Gus Paul, and Seymour Heyman. By 1906 B’nai Israel already had a Sisterhood, whose first president was Frances Gerson. In 1906, B’nai Israel hired Rabbi Joseph Blatt, who would lead the congregation for the next four decades. A product of classical Reform Judaism and committed to interfaith work, Rabbi Blatt was a good match for the assimilated, socially mobile members of B’nai Israel. Over the course of Rabbi Blatt’s 40-year stint at B’nai Israel, he spoke in every church along what became known as “Church Row,” and invited many Christian ministers to give sermons at B’nai Israel. Rabbi Blatt also served as a circuit-riding rabbi for many of the smaller Jewish communities scattered throughout Oklahoma, conducting occasional services and leading life-cycle ceremonies when the need arose. Blatt was extremely active in the larger community and was inducted into the Oklahoma Hall of Fame in 1932, only five years after the honor was established. Under Rabbi Blatt’s leadership, Temple B’nai Israel began to build its own house of worship. Previously, the congregation had been holding services at St. Luke’s Methodist Church. In 1906, the congregation purchased land for a synagogue. Jews and non-Jews alike contributed money for B’nai Israel’s building. In 1907, they laid the cornerstone for the building in a Masonic ceremony. On January 12, 1908, B’nai Israel formally dedicated the temple in a public ceremony that drew Jews from other parts of Oklahoma. 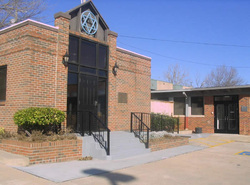 B’nai Israel’s temple was the first permanent Jewish house of worship in Oklahoma. By 1910, B’nai Israel had grown to include 60 members. Its Sisterhood was active as well, thanks to the leadership of Florence Myer, who served as its president from 1913 to 1940. Orthodox Jews in Oklahoma City, most of whom were recent immigrants from Eastern Europe, had little interest in joining B’nai Israel. They had been meeting together for prayer as early as 1890, and had been holding regular services of their own since 1902, meeting on the second floor of the Huckins Estate Building. They also established a Chevra Kadisha and bought land for a cemetery. In 1904, the group was formally chartered as “Congregation Immanuel,” though they later changed the name to Emanuel Synagogue. According to its founding charter, the purpose of the congregation was to hold services and “preach and teach the orthodox Jewish Religion” by creating a Sunday school. Max Herskowitz, a Hungarian-born local dry goods merchant who had been in the U.S. since 1870, was the founding president of the congregation. On the High Holidays, Emanuel’s services attracted Jews from all over Oklahoma, and the congregation rented the Odd Fellows Lodge Building in order to accommodate the increased attendance. By 1905, the congregation had grown to 22 members, and Emanuel began to rent a small room on West Grand Street above the Herskowitz Mercantile Store which they used for Sabbath services. In line with Orthodox traditions, services at Emanuel were conducted entirely in Hebrew, although sermons were often given in Yiddish. The congregation also ran an informal cheder, in which various itinerant rabbis passing through town would teach the boys Hebrew. In 1910, Annie Bloom and Hoda Karchmer collected $50 contributions from community members at bar mitzvahs, weddings, and other events to establish an official Talmud Torah school and hire a permanent teacher, the first of which was Rabbi Oxman. In 1911, Fannie Gladstein organized a Ladies Hebrew Benevolent Society. The women’s fundraising efforts, including the annual Chanukkah Dance, raised money for the Talmud Torah and a synagogue building. Finally, in 1917, Emanuel was able to buy a building in downtown Oklahoma City they could use as a synagogue. Most members of the congregation lived downtown at the time. The new synagogue was not far from the rented room the congregation had been using, and members led a Torah procession from the old home to the new on July 4th, 1917. 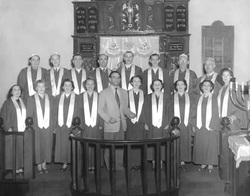 Both of Oklahoma City’s congregations benefited as the city’s Jewish population grew dramatically during the first two decades of the 20th century. The 250 Jews who lived in Oklahoma City in 1907 grew to 800 just five years later. By 1912, the community supported a B’nai B’rith and two ladies aid societies, and in 1912 Albert Herskowitz founded the Oklahoma Jewish Review, the first local Jewish newspaper. Two years later, William Rubenstein opened a kosher butcher shop, which became a community gathering place on Saturday nights after Shabbat had ended. On Passover, Jews from 150 miles away traveled to Rubenstein’s store to buy kosher food for the holiday. In the mid 1910s, the Oklahoma City Jewish community had already begun to include professionals like lawyers, doctors, and bankers, though most Jews were still in retail trade. With amenities like synagogues, kosher food, and the other appeals of big city living, Oklahoma City continued to attract Jewish families. Sam Fagin arrived in 1916 and opened a jewelry and sporting goods business with his uncle Abe and later with his brother Ben. Louis and Rose Fagin arrived with their son Max in 1917, and Louis opened a store the next year over which Rose quickly assumed full responsibility while Louis engaged in Jewish study. Both of the Fagin families would remain important to the Oklahoma City Jewish community, especially Emanuel Synagogue, for decades to come. The Greenberg family owned Streets department store and Parks women’s clothing store following World War I. Ben Hirschland had a box manufacturing business that had expanded across the state by the early 1920s. Brothers Ben and Paul Madansky opened a branch of their family store in Oklahoma City in 1916; they already had two other locations across the state. In 1921, in response to the increasing xenophobia and nativism gripping America at the time, they changed their name to May and took out a full page ad in the Daily Oklahoman explaining that, “We take the final step to prove ourselves wholly American in every sense of the word.” In 1923, the May Brothers store moved to a former bank building, where it remained until 1970. In 1945, two years after Ben May became the full owner of the Oklahoma City store, his sons Sol, Sam, and Milton joined as partners; Milton later bought out his brothers and was the final owner of the business. By 1922, the value of the oil produced in Oklahoma was higher than in any other state. The Oklahoma City oil boom drew growing numbers of Jews to the city. By 1927, an estimated 1,250 Jews lived in Oklahoma City. A number of Jewish families were involved in the oil business, including the Fleischakers, Trachtenbergs, Weitzenhoffers, and Schonwalds. Many of them were in oil field supply and scrap metal businesses, although some were engaged directly in oil production. In 1922, Dave Schonwald arrived in Oklahoma City and became both the president of the First National Bank of Oklahoma City and the president of Blackwell Oil and Gas Company. He was a wealthy man who had business and oil interests in both Blackwell and Ponca City. 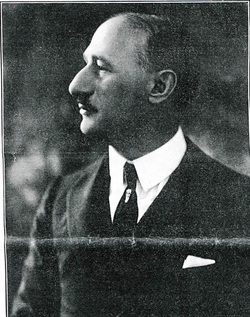 Schonwald became a leading Jewish philanthropist, first with the Joint Distribution Committee after World War I and later with the United Jewish Appeal of the 1930s. He had formal ties to Zionist organizations long before any had chapters in Oklahoma City. Schonwald was among the original stockholders in the corporation that published the Oklahoma Jewish Chronicle, which in 1929 succeeded the Oklahoma Jewish Review. Four years later, Sam and Emma Friedman bought the paper for $200, inherited a lot of debt, and renamed it the Southwest Jewish Chronicle. Sam was the business manager and publisher, Emma the editor and reporter. The paper covered Jewish communities in ten southwestern states, and the couple traveled to each to write stories, even belonging to congregations in many. When Sam died in 1971, Emma continued the paper and took over all of its responsibilities until her death in 1990. The newspaper finally folded in 1991. The Chronicle’s obituary of Sam credited the couple with bringing a “sense of belonging to a larger community” to the “scattered Jewish people” of the Southern and Southwestern states. Although the Great Depression and dust bowl years greatly affected the general population in Oklahoma City—only in the 1960s did the city recover its pre-Depression numbers—the Jewish community remained vibrant. In 1937, an estimated 2,100 Jews lived in Oklahoma City. To manage all the Jewish institutions that had arisen, the Oklahoma City Jewish Community Council (now the Oklahoma City Jewish Federation) was established, with Aaron Weitzenhoffer serving as its first president. By 1946, it served as an umbrella group for more than ten organizations. By 1925, B’nai Israel, with 125 members, was running out of space in its building. The next year, the congregation built a community center that was attached to the temple. They dedicated the new center in a formal ceremony that drew 600 people and featured several local Christian ministers as speakers. One local newspaper article noted the patriotism of the congregation, which chose to hang an American flag across the opening of the new building and to end the program with the Star Spangled Banner. Over the next 15 years, the congregation continued to grow, and Temple B’nai Israel counted 200 members at the time of Rabbi Blatt’s death in 1946. After Rabbi Blatt’s death, Rabbi Joseph Levenson was hired to lead B’nai Israel. Rabbi Levenson introduced many changes to B’nai Israel, moving the congregation away from the Classical Reform of Rabbi Blatt. Rabbi Blatt had been a staunch anti-Zionist. When Emanuel Synagogue’s rabbi joined a 1930 state committee to aid European Jews and to support the creation of a Jewish state, Rabbi Blatt refused. His main focus was to break down barriers between Jews and non-Jews. Blatt had also prohibited such traditional rituals as the bar mitzvah and wedding chuppahs. Levenson was part of a new generation of Reform rabbis not beholden to the principles of the Pittsburgh Platform. Four years into his tenure, Rabbi Levenson introduced the bar mitzvah. In the 1970s he brought back chuppahs and the traditional glass-breaking to wedding ceremonies. In 1975, B’nai Israel celebrated its first bat mitzvah, nearly 20 years after Emanuel Synagogue introduced the custom. Rabbi Levenson also moved B’nai Israel toward accepting Zionism, a process quickened by the establishment of Israel in 1948. B’nai Israel continued to expand during the post-war years. By 1949, the congregation had outgrown its building. Julius and Erna Krouch donated ten acres of land for the construction of a new building, and Norman Berlowitz donated his architecture services. In 1954, they broke ground on a new building and dedicated it the following year. Henry Wolff, the only living charter member of B’nai Israel at the time, lit the ner tamid during the dedication ceremony. Rabbi Levenson maintained Rabbi Blatt’s strong tradition of interfaith friendships, and many Christian pastors spoke at the event. The new temple building was located in northwest Oklahoma City, reflecting the movement of Jewish families away from the city’s center. The new temple also featured an outdoor swimming pool to appeal to the many young Jewish families with children in the congregation. By 1962, 296 families belonged to B’nai Israel. The congregation continued to grow under Rabbi Levenson’s leadership, reaching 375 families by the time of his retirement in 1976. ​Rabbi David Packman became Temple B’nai Israel’s spiritual leader after Rabbi Levenson’s retirement. Like his two illustrious predecessors, Rabbi Packman was devoted to interfaith work. Over the years, he reorganized the interfaith Thanksgiving ceremony that Rabbi Levenson had initiated, and also set up formal partnerships with a Protestant and a Catholic church. The interfaith connections forged over the years were beneficial when many churches offered space and facilities after a tornado damaged parts of B’nai Israel’s building in 1970. In 1990, Rabbi Packman and B’nai Israel joined the NAACP in presenting an annual Martin Luther King Jr. program. Under Rabbi Packman’s leadership, a congregational committee of the Association of Reform Zionists of America was established in Oklahoma City. In 1991 he and his wife Nina led a congregational trip to Israel, marking a complete transformation from B’nai Israel’s earlier anti-Zionism during Rabbi Blatt’s tenure. Over the years, B’nai Israel enjoyed a remarkable degree of stability in its pulpit. For almost a century, from 1906 to 2004, only three different rabbis led the Reform congregation. B'nai Israel's current synagogue. Photo courtesy of Julian Preisler . Emanuel Synagogue did not enjoy the same rabbinic stability that B’nai Israel did. 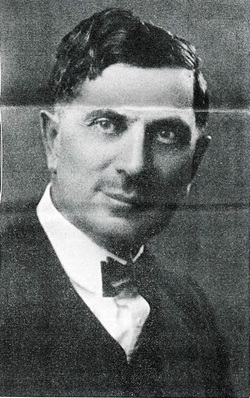 Rabbi Charles Keilin was the congregation’s first full-time rabbi, though he only served Emanuel from 1921 to 1925. In the 23 years between 1921 and 1944, the synagogue went through five rabbis, and by the mid-1980s nine more had been added to the list. Throughout these many transitions, Louis Fagin remained a consistent learned presence for the community. He began his term as president in 1922, and remained president emeritus until 1949. Aaron Hardin came to Oklahoma City in 1946, and spent the next 29 years as the Torah reader, shochet, mohel, and Hebrew teacher for Emanuel. Despite rabbinic turnover, Emanuel Synagogue thrived during the interwar years. In 1931, the congregation added on to their building, constructing the Emanuel Hebrew Center, which became a home for social and educational activities. The new building provided enough space for Rabbi Milton Rosen to open a Jewish day school that taught Torah and Talmud. The center also became the venue for the annual Yom Kippur Dance, where young people could mingle following the break-fast; a social club for young adults grew by 80 members in only six years during the 1930s. Thousands of Jewish servicemen passed through Oklahoma during World War II, and Dorothy Wasserman organized a Jewish USO; the Wasserman house became a bed and breakfast of sorts for Jewish soldiers. Many Emanuel families, including Edward and Eva Sureck, hosted the servicemen, and 100 soldiers attended a community seder at Emanuel in 1943. .By the 1940s, Emanuel Synagogue had begun to move away from Orthodox Judaism. Most of their members were either native born or had been in America for several decades, and had integrated themselves into American society. 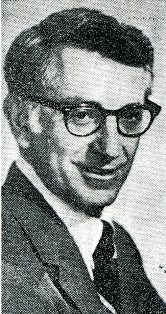 By the time Rabbi Melvin Goodman succeeded Rabbi Rosen in 1938, English had taken over Yiddish as the language of sermons. Members were wealthier than the founders had been at Emanuel’s establishment in 1904, and had used their upward mobility to move from the immigrant-heavy center of town to the northern suburbs. As the congregants moved, they lived too far away to comply with the Orthodox practice of walking, rather than driving, to the synagogue on Shabbat. Emanuel Synagogue also instituted mixed gender seating. As a result, the congregation began a shift towards Conservative Judaism. In 1946, under the leadership of newly arrived Rabbi Aaron Doctor, Emanuel Synagogue joined the United Synagogue of Conservative Judaism. A few older, first-generation immigrants and indignant traditionalists attempted to keep an Orthodox minyan alive downtown, but they soon abandoned the effort. ​ Emanuel Synagogue saw more changes under the leadership of Rabbi Israel Chodos, who came to Oklahoma City in 1947 and led the congregation for the next eight years. As a result of his appearances on the weekly “Your Bible” television program, Rabbi Chodos became somewhat of a local celebrity, earning the respect of the entire Oklahoma City Jewish community. Under Rabbi Chodos’ leadership, the synagogue grew to its peak membership of 340 families. In order to achieve better attendance, Rabbi Chodos instituted late Friday night services. He also brought Dr. Louis May, who established a co-ed choir that sang on Friday nights and holidays. 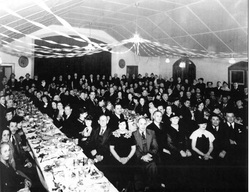 Social gathering held at Emanuel Hebrew Center, 1934. By the late 1940s, Emanuel decided to build a new synagogue. The northward movement of Oklahoma City’s Jews had continued, and it was time for the synagogue to follow suit. The new building was dedicated in 1949 with a celebration featuring Israeli folk songs and the singing of the Zionist anthem “Hatikvah.” But, like Temple Israel had done nearly 25 years earlier, the program also opened with the Star Spangled Banner and featured city officials which were intended to signify the members’ patriotism and full integration within the greater Oklahoma City community. Since Emanuel was no longer Orthodox, it’s not surprising that the new building did not have a mikvah (ritual bath). 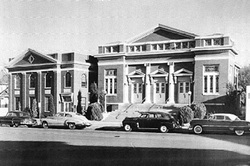 In 1962, Emanuel built an additional sanctuary at the synagogue. The Sisterhood had collected money for years, and donated $35,000 to the building fund. Although Emanuel was Conservative, it took several decades for women to achieve equality within the synagogue. Bat mitzvah girls lead services on Friday nights and read from the Haftorah on Shabbat mornings. 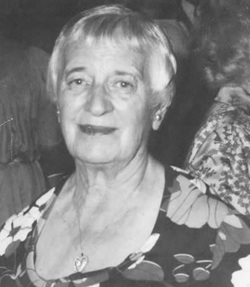 Thanks to efforts by Sadie Lieberman, women became voting members of the board in 1960. Other achievements for women took longer. In 1975, Adell Alpern became the first married woman to chant the Haftorah at Shabbat services, and women weren’t called to the Torah for an aliyah until 1978. Ruth Janger became Emanuel’s first female president in 1986. Only at Rosh Hashanah services in 1991, 45 years after joining the Conservative movement, were women counted as part of a minyan for the first time. In the 1980s, Rabbi Charles Shalman began to reintroduce some of the traditions that had been discarded when Emanuel adopted Conservative Judaism. He oversaw the opening of a Solomon Schechter day school in 1985 and the construction of a mikvah in 1987, both of which were intended for the entire community, regardless of synagogue affiliation. Despite these changes, Emanuel Synagogue remained a member of the Conservative Movement. movement away from Orthodoxy Judaism. The Oklahoma City Jewish community grew slowly but steadily during the post-war era, going from 1,600 people in 1948 to 2,400 in 1984. This increase benefited B’nai Israel, which grew to 430 member families in 1985. Soon after, the Reform congregation began to shrink, falling to 377 member families in 1995. Emanuel Synagogue reached its peak size in the mid-1950s, after which it began to slowly decline. Since the two congregations were shrinking, they decided to work together to benefit their children. In 1982, the two congregations merged their youth groups. In 1989, they formed a joint religious school, though their Hebrew programs remained separate. Children from both congregations attended the Jewish day school, though it closed in 2002. In 1988, the community established Camp Chaverim, a Jewish day camp that is still going strong today. In 2003, B’nai Israel celebrated its 100th anniversary and was the oldest active Jewish congregation in Oklahoma. In 2004 Rabbi Barry Cohen was hired as the temple’s fourth rabbi, and in July, 2012 Rabbi Vered Harris became the fifth in the temple’s history. In 2009, Rabbi Abby Jacobson became Emanuel Synagogue’s rabbi. The Conservative congregation still offers daily minyans as well as services on Friday nights and Shabbat mornings for its 225 member families. These vibrant congregations remain the anchors of a strong, stable Jewish community of around 2,500 people.